Fairy Tales Estranged A review of Sandra Kasturi’s “The Animal Bridegroom” (Tightrope Books). 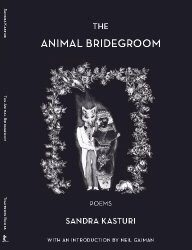 “The Animal Bridegroom” leaves a breadcrumb trail of poems to bring the reader through cultural myths and legends to a place of self-reflection. Sandra Kasturi uses fairy tale themes to open a pathway into the deep woods of myth, where she explores the changeable power of stories, their ability to shift and change like the seasons. In her poem “The Gretel Papers”, Kasturi invites the reader to look at the impact of fairy tales on the characters. Fairy tales normally don’t explore beyond the happily ever after, but Kasturi invites us to ponder what would happen to the young protagonist of Hansel and Gretel after Gretel has killed the witch and has to live with the long term effect of her actions. Here we encounter a Gretel who has experienced a lifetime of depression and post-traumatic stress. In “Chaos Theory”, she explores the way that we live surrounded by myth, enwrapped in a w world of words and stories that shape us and that we can’t escape from. We are made up of the cultural stories we are told. In “Verses for the Lost”, Kasturi uses the Red Riding Hood myth to remind all of us that we are lost in the forest and reminds us that there are no final destinations in life and that everything is always changeable (including grandmothers who wear their wolf suit on the inside). In “Five Cantos from the Prayer Book of Aphrodite”, the reader is drawn into questions about love and its complexity, invited to imagine the diversity of love and the notion that some people’s horror is the adoration of others. “Carnival Perpetuel” highlights that the Cinderella tale is a tale about time and the passage of time. It explores the way that we imagine ourselves into the future and, especially, highlights the way that women’s time is structured in a patriarchal world, exploring the demands on women’s time, the devaluing of women’s work, and the notion that women are always structured as existing in a temporal framework, always at risk of running out of time since women are told in our society that their value only exists so long as they are young. Kasturi teaches us about the dangers of wishing for a better life and that these wishes often serve to continue current oppressions of women. “The Animal Bridegroom” reminds us of the significance of fairy tales and the power that narratives have to shape our lives. She brings attention to the changeability of the world and its tendency to shift the narratives we tell ourselves. Sandra Kasturi weaves a spell of words around the reader, performing a difficult type of magic – the magic of transforming the way we think about the world around us. What Makes Fairy Tales So Brilliant? Fairy tales always exist in multiplicity, in versions. There is never one TRUE version, but rather a fluid polyphonic group with multiple voices sharing different takes on the same tale. Fairy tales possess the magic of changeability. Born in oral narratives, they have the power to shift and change with each telling, adapting to new tellers and new audiences. They resist the idea that there can be only one truth and illustrate that there are always multiple truths, each with different messages that speak to different people. Fairy tales are delightfully slippery and whenever people seek to pin them down, they adapt, change, and modify themselves to speak to a new generation and a new group of people. We create our fairy tales to tell us about ourselves, to learn from our own imaginative words and explore our boundaries. Fairy tales let us walk out into the darkening woods of our own subconscious and see more of ourselves, the selves that we tell into existence when we sit around a camp fire. In our fairy tales, we encounter strange beings – beasts and otherworldly entities and animals that act far too much like we do – but these encounters are always with ourselves, always about us colliding with murky mirror images of ourselves, and those mirror selves always have something to share, something to teach to us. Our fairy tales shift from generation to generation to capture our new ideas, interests, perspectives, and our anxieties. But what fairy tales do we need for this age? What should we be telling ourselves to learn and change? Now when we venture into the woods, it is not the wolves that Red Riding Hood should fear, but they should fear us because of the damage we have done to our animal neighbours. Tales of commoners who become princesses have reinforced the oppression of women and made sure that we don’t critique wealth because so many people believe they can go from commoner to royalty, so how do we change that tale? We have told tales of desiring youth and fearing old age, so how do we switch it so that we can desire our own aging? How do we tell tales of enchanted apples when they are sprayed with chemicals and waxed? We are storied animals, composed by the stories we hear, the stories we tell, and, most importantly, the stories we tell ourselves to get us through each day. I have to admit to a little bit of hesitancy when picking up Tesseracts Eighteen. While I have loved the Tesseracts series since I first discovered it and feel that Canadian Spec Fic owes a lot to this long-standing staple of Canadian SF, I was a bit hesitant about the theme. I had heard early on that Tesseracts Eighteen was going to be about the topic of religion, and my first concern was that authors may use it as a soapbox to push a conversion narrative on readers. I also worried that people might tokenize non-Christian religious systems because of the prevalence of Christian beliefs in Western society and the lack of understanding of other religions that this often creates. Fantasy, as a genre, is particularly prone to this sort of unintentional religious discrimination since it often portrays “bad cultures” and “villains” as having Islamic-like faiths, and I worried about the potential of this collection to become an assortment of cultural stereotypes. BUT when the title of the collection was released “Wrestling with Gods”, some of my hesitancy dissipated. There was a potential here for looking at the wonder that happens as people try to understand their place in the world and their beliefs. So, I picked up a copy and began reading. Within the pages of this collection, I discovered not people trying to speak their believed TRUTHS, but rather people speaking about their QUESTIONS. This was a speculative volume after all, filled with a sense of wonder and a desire to push the boundaries of our understanding of ourselves and our place in the universe. This collection was more about humans and their obsessions, fears, desires, and discoveries than it was about the gods. These stories presented multiple paths for human exploration, each filled with signposts that were question marks inviting us as readers to reflect on our own position in the world and our thoughts about where we come from and where we are going. Wrestling with the Gods is a collection that challenges rather than conforms. It asks readers whether at times the opposite of the expected norm may be the best path and invites readers to question what they are told is Truth. It illustrates that the idea of Truth itself is subjective, open to question and interrogation, and ultimately that there will always be a multiplicity of truths rather than a singular Truth. Through the power of stories, with all of their potential to embody multiple truths and interpretation, Tesseracts Eighteen invites us to recognize that the concept of Truth is infinitely more complicated than we can imagine and it is always multiple and contradictory, but that we should keep imagining and through imagination we might discover our own collection of truths. Stueart and Kerzner collected stories that question hegemonic power and taken-for-granted assumptions, inviting readers to constantly ask questions and discover new ideas and perspectives. Within this collection are vampires questioning their faith (and fear of the cross), priests establishing shrines on Mars, manifestations of the natural world that challenge the idea of human ownership, questions about the connection between religion and mental health, explorations of the relationship between technology and belief systems, speculations about the connection between humanity and the animal world, and the exploration of the way that reading sacred or forbidden books can change us in fundamental ways. Tesseracts Eighteen is a collection about boundaries, and is interested in pushing those boundaries because within stories we discover a multiplicity of adventures, ideas, new philosophies, and new ways of viewing and understanding the world. -Jerome Stueart- “The Disappearing Lion Trick” in Tesseracts Eighteen: Wrestling with the Gods (Edge, 2015).